EVERY time I step outside the San Gabriel Valley I’m reminded how much better they have it than we do when it comes to federal funding. I’ve got a local chip on my shoulder the size of Mount Wilson. When I get all riled up as I did this past weekend, it can be a parochial whine that resembles a full case of sour grapes. But I don’t care if people call me a homer. Because this is where I’ve lived for nearly 30 years, where I bought my first home, where I’ve raised my children, where I’ve worked as an indefatigable advocate. While visiting the Bay Area last weekend, I stumbled upon a National Park Service park in the middle of the city called the San Francisco Maritime National Park. It was closed for renovation during prior visits but since 2008 has blossomed under the U.S. National Park Service’s tutelage. Again, as someone who enjoys biking along our San Gabriel River, hiking the trails of our foothills and majestic San Gabriel Mountains, the parallels between the NPS restoration there and our dream of a coordinated, restored river and mountains “park” here became as clear to me as the view of the bay after the fog lifted. Our rivers, our mountains, our trails, even nearby county parks (Schabarum Park, Whittier Narrows Recreation Area) are precious resources. And while access and trails have improved, they are still a hodgepodge of open space without any true connecting thread. One of my passions is photographing the relics in the mountains that sit rotting or lay victim to thieves and graffiti hounds. 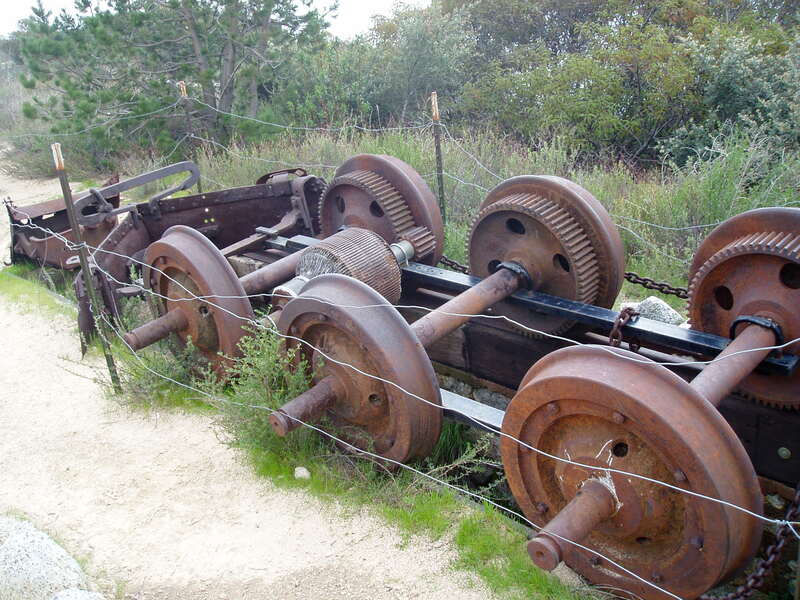 Mount Lowe Railway, Crystal Lake Campground (now getting a face-lift), Deer Park, Henninger Flats, Dawn Mine, Follows Camp, the Bridge to Nowhere, even the Mount Wilson Observatory need help. Many have tried to restore these places and while their efforts are laudable they are usually underfunded. Ruins of Mt. Lowe Railway as seen on trail high above Altadena. The former Rep. Hilda Solis, now President Obama’s Secretary of Labor, had proposed making the San Gabriel and Rio Hondo rivers part of a national recreation area. This would bring one coordinating agency, with one set of rules, to tie together our resources and make them more accessible to the public. This could be the answer to our forest as well, which through vandals and fires (and sometimes, as in arson, are related) are destroying historic structures. The Vetter Mountain Lookout was lost in the recent Station Fire, a place I remember visiting with a buddy back in 2002. Gone are the 360-degree views it offered of a back country of canyons and tree-covered mountains and silent beauty. In San Francisco, the NPS is nearly finished restoring the Aquatic Park Bathhouse built in streamline moderne architecture in the 1930s. The adaptive re-use for the basement includes a senior citizen center and exercise room. Upstairs is gallery space and a veranda with views of San Francisco Bay and the Golden Gate Bridge. Tile mosaics of fanciful fish have been restored to their original brilliancy. Inside, wall-to-floor murals damaged by seeping water were returned to their original condition. Next door, the Hyde Street Pier has become a shining gem of the NPS. I boarded the 1886 square-rigger Balclutha, a tall ship used to import salmon from Alaska to the famous cannery in San Francisco. NPS displays throughout the ship explained the ship’s journeys using captains’ logs and personal journals of seamen. Also on display were tug boats restored with fresh coats of black and red paint, old ferry boats used to transport passenger cars from the peninsula to points East and North, and shrimp boats used by Chinese immigrants. Even the wood shop where boats are restored by NPS technicians was part of the display. A National Park Service park in an urban interface? If it works in San Francisco, it can work here. 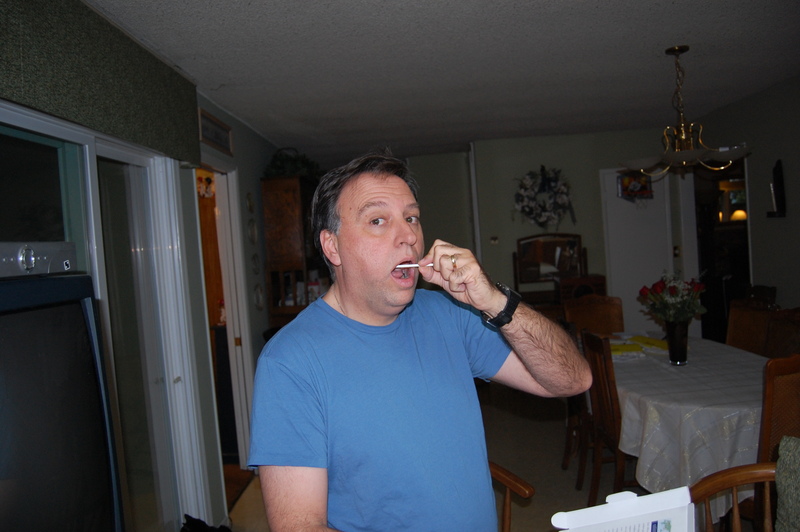 Swabbing my cheek for The Genographic Project. My DNA is set to hit the mail Tuesday. Results in six to eight weeks. WHY are we so obsessed with the past? For instance, after using a social networking tool such as Facebook, I was contacted by classmates from my alma mater, East Meadow High School in New York, (Class of 1976 — Go Jets!) and Nassau College in Garden City, New York, where I earned my Associate of Science degree in biology. I’m not one to look back. Just a glance at my high school yearbook picture frightens me. Reading e-mails from acquaintances I last spoke to on the playground of elementary school some 40 years ago has been both intriguing and disturbing. Hearing that a girl I had a crush on in sixth grade has been going through a rough, rough divorce and a paralyzing accident made me feel sad and also, ambivalent. It may sound cold, but I wanted to remember her as that happy-go-lucky girl with whom I shared some mischievous moments in grade school. Not as an adult with problems. I want my childhood memories to stay that way — as memories of coming of age — not today’s realities. At the same time, it was flattering to hear from Glen, a classmate from elementary school through high school, who is now the CEO of a healthcare advocacy group in Albany, write about the honorable profession of journalism I find myself in. Thanks, Glen, I think. 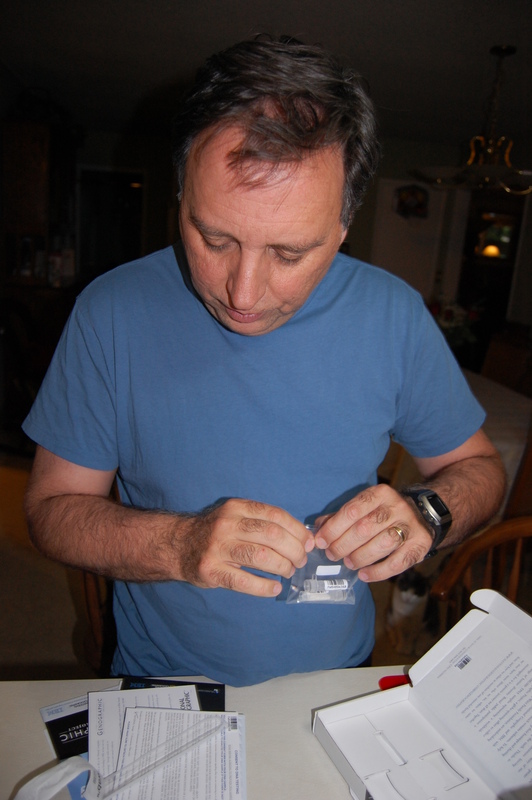 So when my wife, Karen, asked me to participate in an experiment to trace my ancestors through my DNA, I didn’t immediately latch on to the idea. I have enough trouble getting along with my current relatives. Now I’m digging up ones from the past? But being a man who appreciates science (I was going to be a plant biologist), I said yeah, why not. Spencer Wells, who spoke at the Distinguished Speaker Series at the Pasadena Civic Auditorium on Jan. 13, is the leading scientist behind the Genographic Project. Wells, along with National Geographic Society, IBM and the Waitt Family Foundation, are using DNA samples of ordinary people to trace the pattern of migration on the Earth. In short, our DNA tell a fascinating story of human history — better than any Facebook status or Twitter tweet. So far, Wells has discovered that “the common ancestor of every man alive was an African who lived around 60,000 years ago.” Genetic data say people started leaving Africa about 100,000 years ago for India, Southeast Asia and Australia (hence, the connection with the indigenous aboriginal people to Africa). From there, they traveled to Europe, then to Siberia and the Arctic and from there, to the Americas. Wells said in our modern cities and suburbs, we live among people of different backgrounds. But we are separated from our relatives who can pass down stories from generation to generation. 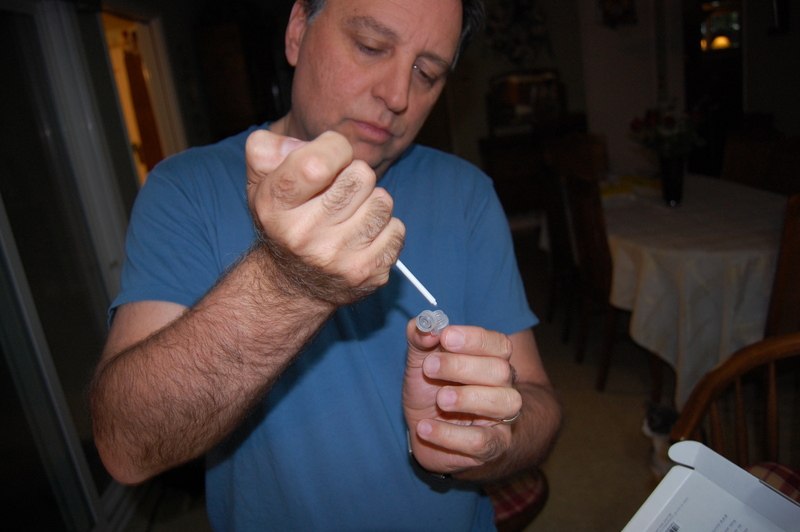 His genetic mapping project in a way takes the place of storytelling and oral histories. And redraws the picture of a forgotten human storyline. So this weekend, I will swab my cheek, once in the morning and once again in the evening. My samples will be sent off to the project labs with only an assigned bar code. In six or eight weeks, I’ll be shown a report through a web portal using my private log-on (no names are given or used). I’ll update you all then. But before I send off my DNA in a test tube, I have a decision to make. Do I ask them to trace my X chromosome, called the mitochondrial DNA, passed from mother to child, for a picture of my maternal ancestry? Or my Y chromosome, or Y-DNA, which will trace my paternal family roots. Since I’d like to discuss the findings with my mom, who is still very much alive, I may choose the maternal track. Only men have to make this decision, since women have two X chromosomes (and no Y). I’ll ask my inner scientist. Or maybe I’ll let my wife decide. Either way, I’m getting excited about finding out the past. I follow the s-shaped turnoff down beneath Irwindale Avenue. I wound around until I saw this billboard. 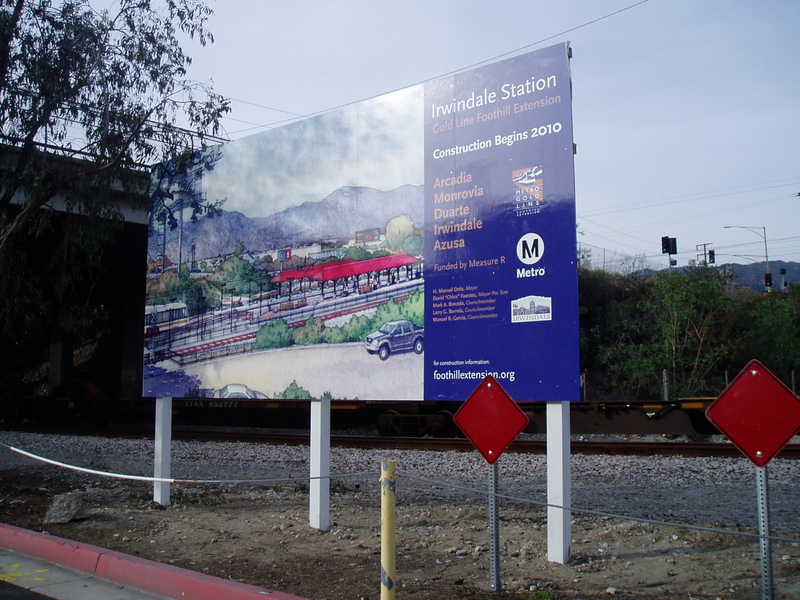 This is where the Irwindale Gold Line station will be. It lies in the shadow of those big, metallic beer tanks of MillerCoors, a place us San Gabriel Valley oldtimers call Miller Brewing. I can see it now. All those beer workers getting off shift, hopping a train home. It is an odd location. But who knows, perhaps it will actually serve other manufacturing and office jobs near Irwindale Ave and the 210 Freeway. Two of our local community colleges this week received full accreditation status. Rio Hondo College in Whittier and Citrus College in Glendora. Rio Hondo fought its way back after the accrediting institution for community colleges gave it a warning last year. The Western Association of Schools and Colleges’ (WASC) Accrediting Commission for Community and Junior Colleges said the school was lacking in institutional and leadership areas. This week, as reported by our reporter Tracy Garcia, the WASC returned full accreditation for the next six years. Congratulations to Rio Hondo College. At Citrus, the college continues its excellent standing. On Wednesday, it learned its accreditation was re-affirmed for another six years. “The fact that our accreditation was reaffirmed validates Citrus College’s effectiveness in meeting our institutional mission through the dedication of our highly qualified faculty and staff, and through the institution’s outstanding academic programs and student support services,” said Citrus President Geraldine Perry in a written statement. Kudos to them. In fact, Citrus has always done such a great job that they are hardly in the news. As the UCs become more expensive, and the CSUs cut back on enrollment due to budget cuts from Sacramento, our community colleges become even more important to high school graduates looking to continue their education. In fact, a lawmaker in Sacramento thinks so much of community colleges he is floating a bill that would allow them to offer bachelor degrees.